If you’re anything like me, it can be a nightmare trying to source healthy, affording and appetising snacks for your kids. 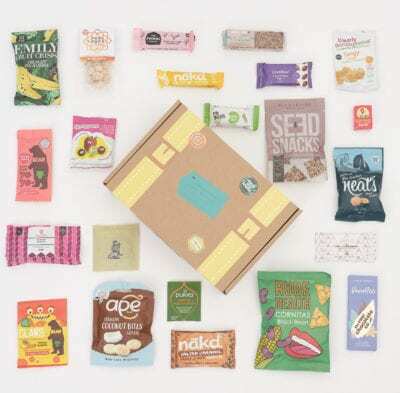 Now you can take the hassle out of family snacks with a monthly Treat Trunk – a brand new subscription box filled with healthy snacks for all the family to enjoy together. Mumblers discount: get 25% off your first subscription! Launching the only healthy subscription snack boxin the UK created for both children and parents, founder Sally Wade’s vision is to take the hassle out of healthy snacking by providing products packed with goodness for all the family. With families becoming increasingly aware of what they eat, Treat Trunks mean parents no longer need to spend precious time trying to decipher the complex labels of each product or making homemade snacks. The Trunk will be carefully curated and delivered to your door on a monthly or quarterly basis ready for you to enjoy as you please! Treat Trunk is the brainchild of mother of two Sally Wade who, after struggling with an unhealthy and addictive relationship with food growing up, vowed to live a healthy lifestyle with her children. Since having children, she has found that limiting unhealthy sugars and avoiding artificial additives has helped her children to improve their concentration, keep calm and manage their emotions. And it has improved her own health and wellbeing immensely, enabling her to be a better parent. As a busy parent short on time, Sally was frustrated with how difficult it is to know what is and isn’t a ‘healthy’ snack in the supermarkets and how little variety there is on offer. Priced from just £19.99 per Trunk, the boxes provide quick, easy and healthy snack solutions for busy families and the boxes are vegan friendly too. Including brands such as BEAR and Ape, the Treat Trunk team apply a common sense approach to choosing their products – dairy free, vegan, no nasty additives, and sugar sensible. All far better for you than a visit to the local sweet shop. Many of the products also come in recyclable or biodegradable packaging and each brand’s ethics are taken into consideration before going in the Trunk. The trunks contain a mixture of snacks for all the family. Some especially designed for kids, containing natural ingredients, which could help improve children’s behaviour, attention span and energy, as well as filling their growing bodies with the goodness they need. And some chosen specifically with parents in mind for their wellbeing properties – whether that’s energy boosting, hormone balancing or relaxing. To order a Treat Trunk visit www.treattrunk.co.uk Use code MUMBLER25 which will offer 25% off your first month’s subscription (any subscription).